My very special year in Israel is coming to a close; this June blog will be my last from what my friend and tour guide Zvi Levran calls "The Over-Promised Land". It is almost impossible—no, make that it is impossible—to describe how transformative being in Israel has been: to live here and not be a tourist; to make new friends; to join a synagogue and become part of that community; to try experience Israeli life as fully as possible; to become fluent again in Hebrew; to not just see but to be. The year has been all that we hoped for and more. Now as I prepare to come back to Toronto, I am thinking about the best and the worst of life here, and have compiled for this last blog my list of hits and misses. These musings are in no special order of importance. 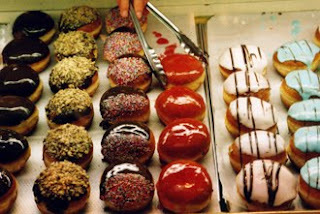 What will I miss most about Israel? What will I miss least? The incompetence, attitude, and inability of most public servants to see past their own buracracies. So what am I taking with me from this year? (You mean besides a jar of cherry tomato jam, some real stone-ground tehina from the Old City and some new jewelry?) The feeling of understanding so much better what being a part of Jewish history is; what it means to struggle, and to triumph, and to be a victim and a victor; the danger of being a triumphalist or a victim or a victor; what it means to long for peace and what it means to work for peace and what it means to compromise for peace; how to dream bigger, and how to live smaller; how to reach higher and stand more firmly planted; in short—what the “real” in Israel means. Favorite humus place in Jerusalem: Ben Sira (on Ben Sira Street)- really the real deal; 2nd prize goes to Pinati on 13 King George but don't think to linger there, its just for a quick bowl of warm yummy humus. 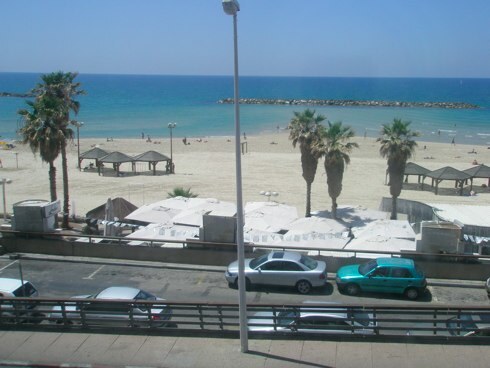 Favorite Tel Aviv hotel: Alexander Suites near the port or Cinema Hotel in town. Also Park Plaza Orchid on Hayarkon has a gorgeous view from the lobby and a nice breakfast but only stay in their renovated rooms. Favorite downtown veggie restaurants: Tmol Shilshom or Village Green. For a "fancier" veggie meal go to Te'anim on Emile Botta. Favorite BEST EVER Challah covers, tallitot, and many other great souvenirs, too many to name, is Yad Lakashish (Lifeline for the Old), 14 Shivtei Yisrael. Beautiful hand made products done with love by 80-90 year olds. Shopping is a pleasure and a mitzvah. 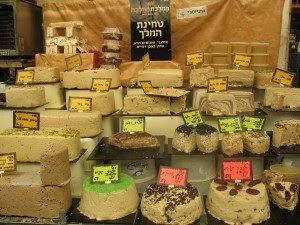 Favorite shops on Ben Yehuda mall: Vizon (ask for Rami) or Bat Sheva gifts (ask for Oved). Worth going around the corner to Ganz on Rivlin Street; ask for Suri. There are so many places that have lots of chazerai, these have some finer things. 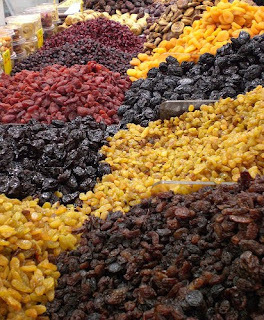 Favorite health food store: there aren't that many, but among the better ones is Z'mura on Amatzia (off Emek Refaim) or its sister store with a little cafe on Yad Harutzim (off Rivka.) Anise is more common and overpriced; Teva Net in Machane Yehuda leaves alot to be desired. Favorite shakshuka: hands-down best is at Moma in Jaffa (Oleh Tzion 7). Second prize goes to the green shakshuka at Emil's. Favorite croissant and hot chocolate: Cafe Betzalel on Shatz Street, across from Betzalel Academy. The hot chocolate is made with hot milk and truffles, need I say more? Favorite bakery: Bet-Lehem on Derech Bet Lehem. Say hello to Sigal for us. Favorite Friday flowers: the guy at the gas station on the corner where Keren Hayesod becomes Emek Refaim. Also sometimes the guy in front of Super Moshava on Emek Refaim. Actually any guy selling flowers on any street corner. Favorite ice cream: Arlequin in Tel Aviv. Forget ice cream in Jerusalem; Aldo is everywhere and its just ok. Favorite Old City humus: Abu Shukri, aboslutely. The small one across from Lina (its direct competition) is better than the big one near the Austrian Hostel. Favorite Old City shopping: Just wander around. Go deep into it to get past the more touristy places, and then forget about ever finding the same place again. 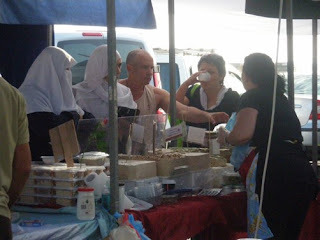 Something you don't see every day: An Arab woman in full face covering buying halva from a secular Israeli at a Tel Aviv street fair. My friend and tour guide Zvi Levran puts it this way— Tel Aviv: sand, sea, and the search for identity. Tel Aviv, on the other hand, is New York with a beach. Walk down Shenkin Street and all you’ll see is English. Unlike Machane Yehuda, the fruit and vegetable open-air market in Jerusalem which takes up several city blocks and has a life of its own, the Carmel Market seems a pale, old-fashioned shuk which doesn’t really fit in anymore; one long row of vendors who don’t really mean it when they hawk at you and a kind of embarrassment that there “still” is an outdoor market at all. Tel Aviv screams: new port, downtown, boutique supermarket, Nahalat Benyamin upscale crafts fair. There’s no Arab shuk, no colourful exotic-looking Christians in hoods and robes. 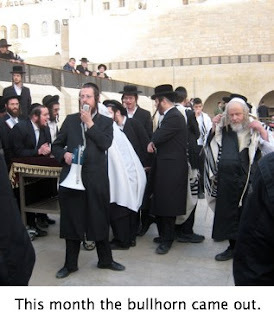 Of course there’s no Kotel, no locus of holiness, and the Chasidim look utterly out of place. It has a vibe, a young, hip, I’m-oh-so-cool-Telavivian kind of vibe, even on Friday nights when the stores are closed and the streets are quiet. Unlike Jerusalem where you hear z’mirot as you walk home on Friday night, in Tel Aviv you hear guitars and radios. Tel Aviv is Paris, and people dress the part. Unlike Jerusalem where the “look” is as many layers and long skirts as you can wear with a big head-scarf, in Tel Aviv the “look” is black on black, skinny girls in tight dresses and guys in “I’m-just-coming-from-the-beach” board shorts. We get on a bus in Tel Aviv and the driver is a woman, short butch haircut and lots of tatoos. We pass a store called “Kingdom of Pork.” Openly gay couples hold hands and you have to ask first if the restaurant is kosher. But Tel Aviv can also drive you crazy. What is Jewish here besides for hearing some Hebrew? Who is thinking about Jewish identity here that goes beyond building a city out of sand dunes? Jerusalem is Biblical history, where Abraham walked and King David sang. You feel old there, not old in a bad way but part of some ancient story that includes you and makes you feel part of something that goes back a long, long time. Jerusalem is all sweeping vistas, gorgeous golden light at dusk and the Golden Dome and the walls of the Old City which draw you in and make you want to connect. Jerusalem is about Shabbat which feels natural. Jerusalem tells you stories about your past, about a time you didn’t know you were a Jew. Tel Aviv is Zionist history. You meet The Great Names there: Herzl, Jabotinsky, Ahad Haam. You meet them in their top hats and Sunday suits and walking sticks in the cafe, and you have intellectual debates over the normalization of Jewish history “now that we have a State.” You sit with them in the park on Shenkin and discuss the Jewish character of a Jewish country as Filipino nannies wheel their elderly charges around and you say to yourself “that old man danced in the streets here when Ben Gurion declared the State...that old woman planted the trees here on Rothschild Boulevard.” Tel Aviv makes you breathe and smile and laugh. Tel Aviv makes you want to learn the new Israeli dances. Tel Aviv also tells you stories about your past, about a time you didn’t know you could live free as a Jew. I don’t know where I would choose to live, in the City That Doesn’t Sleep or in The City of Light. Which one is “a nice place to visit but I wouldn’t want to live there?” What a blessing to have the choice. Friday before Pesach. I attempt to shop at the open fruit and vegetable market of Machane Yehuda. It’s not yet totally crazed but very close. The baker calls out, “Pita: end of season sale!” The deli guy jokes with me that the noodle kugel I buy for Shabbat lunch is already kosher-for-Passover. Pungent piles of fresh purplish garlic line the stalls: some Sephardic families will gently and laughingly whip each other with the long green stalks at the Seder to remind themselves of the Egyptian taskmasters. 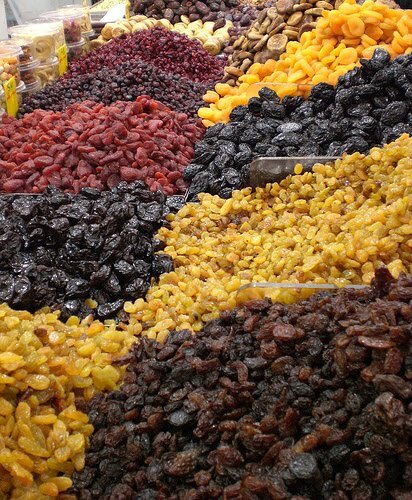 Dates are on sale everywhere, as most Sephardic charoset recipes are based on them. I snag the last kilo of good Medjols for half price. There are lots of posters advertising “yeshiva bochurs” who will clean and kasher your kitchen for you. Sunday is Palm Sunday and we hear the church bells ringing. There is a beautiful processional in the Old City, singing hosannas and waving palm branches. We bring our dishes to be kashered in the communal boiling water “hagalat keilim” in our neighborhood. We go out to our favorite Italian restaurant for our last chametz pasta dinner and the owner who made aliyah from Rome 30 years ago sings us the Four Questions in Italian. The day of Erev Pesach we burn our chametz in a convenient chametz-fire right in front of our apartment building that someone else had started earlier in the day. Kids and families and couples keep coming by to “use” the fire and toss their last bread pieces in. The whole neighborhood smells like a campfire. First day of chol hamoed and people are out in full force. I have never seen so many cars and so many people on the streets of Jerusalem. Here is a typical picture of what I saw on just one street downtown: three Chasidic men in gold caftans, white knickers, white belts and huge shtreimels; a Russian Orthodox priest in a long black robe standing in front of a downtown hotel giving out blessings while people lined up to kiss his ring; secular Israelis eating kosher-for-Passover crepes; and lots and lots of American tourists looking a little shell-shocked by the kosher-for-Passover Ben and Jerry’s. We attend a picnic on chol hamoed at Liberty Bell Park, along with many other families, and we form a circle to sing spring songs and do a unique and special ceremony called Birkat Ha-ilanot: Blessing of Flowering Fruit Trees. There is an old Kabbalistic custom to go out sometime in the month of Nisan—preferably out of the city but in Jerusalem it’s possible to do it right in any park—find a newly flowering fruit tree, and say a special blessing: You are Blessed, our G-d and G-d of our ancestors; Your world lacks for nothing, and You have created beautiful creations and beautiful trees, so that we may be able to enjoy them. You can only say this on a tree that has started to flower, and though we sat under budding olive trees we could not find any flower. However after the picnic we decided to go to one of the city’s museums and right there, right on the branch of an olive tree planted right in the middle of the sidewalk, we saw our first flower, and chanted the blessing as buses and cars whizzed by. Passover is Hag Ha-aviv, the Spring Holiday. Spring has definitely sprung. There is joy and cleanliness in the air, new clothes and new shoes and new expectations, and though we feel a bit heavy eating too much matzah, there is a sort of lightness we cannot fully explain. Purim in Israel is a hoot. Costumes everywhere, like Halloween on steroids. Everybody dresses up, there are lots of parties, the merchants in Machane Yehuda don wigs and give out free hamentashen (called "Haman's ears" here- oznei Haman.) Two solid weeks before Purim the kids stop having "real" school and it's all about celebrating. The fun is supposed to start on Rosh Hodesh Adar. 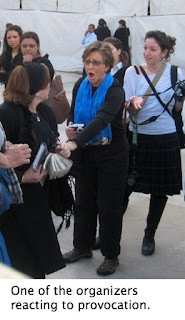 Last year, I wrote in the CJN about my experience with Women of the Wall on Rosh Chodesh Adar in Jerusalem: the rage I experienced coming from the men’s side, the fear from the women’s side, and my own disheartenment while praying with this group of sincere women at Judaism’s holiest site. One year later, again on Rosh Chodesh Adar, I went to the Wall to pray with them. 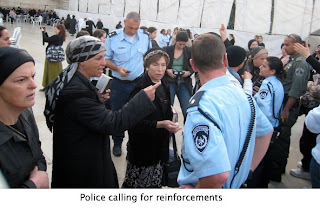 This time, there were close to 200 women gathered there, as since the arrest of Nofrat Frenkel for the “crime” of wearing a tallit the monthly prayer sessions have grown larger and larger in support of the idea that any Jew should be able to pray at the Kotel as they wish. This time, there was a large contingent of Masorti kids from the Israeli Conservative youth movement flanking us on either side. This time many male supporters came and stood on the men’s side nearest the mechitza, forming a sort of protective barrier between us and the men climbing on chairs to scream and curse at us. 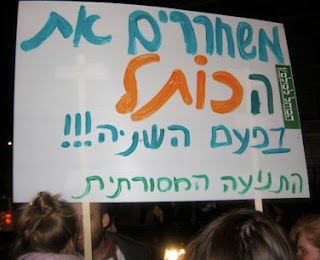 (For Adar the screamers brought a bull horn so we could hear them call us “Amalekites” more clearly.) This time we were protected not only by male police, but also by male army officers called in to help when haredi women tried to aggressively break us up by entering the tightly-knit group and physically pushing us out of the plaza. How odd it was to be praying behind a row of bare-headed male soldiers in the women’s section. When the haredi women became vocally abusive, shrieking at us (we are Christian lesbian Reform blasphemers) we kept on singing Hallel. Purim Shpiel meets Mahatma Gandhi. There is something profound about singing in the face of people yelling at you. I thought of chanting the Megillah which reminds us that change comes from within us. I thought of Queen Esther going against the odds. I thought of how everyone just wants to be a little of someone else every now and then, and about how we are supposed to get so drunk that we don't know the difference between our enemies and our friends. What a way to start the month of fun and games. It struck me later that when we read from the Megillah at the end of chapter one about the threat of women not obeying their husbands, and the sarcastic decree which went forth from Ahashverosh commanding each man to be "king in his own castle" after Vashti refused to be degraded, we really read about the way society perceives the power of women as a national and cosmic threat. Instead of seeing the Women of the Wall as a sincere group of ohavei haShem, some Jews see us only as a threat to the system. Would that they could hear the Megillah as a mocking critique of this kind of drunken, irrational fear of women gathering and expressing their humanity, not as a justification for it. I went to Megillah reading worrying a lot about the Rosh Hodesh gathering, but of course got carried into the Purim spirit soon after. Purim evening was rainy and cold. I love that Israelis never complain at all about the rain; they call it "geshmai bracha" or rains of blessing. Purim day was sunny and everyone was in a good mood in Jerusalem; the bus drivers wore funny hats and lots of kids came in from yeshivas all over the country to revel in Jerusalem's special day (Jerusalem celebrates Purim a day later than everyone else in the world because it is a walled city and the Megillah says walled cities celebrate a day later! But only cities with walls from the time of Joshua.) Everyone seemed to be smiling. And they don't start stressing about Pesach the day after Purim. Matzah doesn't appear on store shelves with the ominous warning that this is all there will be of the brand of egg matzah that you like. The prices don't skyrocket within days. Most Israelis don't stockpile gross over-processed "ready to bake" Pesach products. So it's life as usual for another few weeks till the ONE--I repeat--ONE Seder! How civilized can you get? My only association with poppy fields is a poem (by John McCrae) most Canadians know well. “In Flanders Field, the poppies grow...” The poem is quite sad, reminding us of young soldiers whose lives have been cut short by war. Last week we went out to see the calaniyot, and I was again struck by the passion of Israelis for the land. Going out to see the calaniyot is a February tradition. These same Israelis who shout into cell-phones, who drive aggressively, who push their way past you onto a bus, who never stand in orderly cues, and who will argue with you over almost anything, suddenly become absolute marshmallows melting at the sight of a red flower in the grass. They get choked up to see more than 2 flowers in a row. They stop the car, laugh out loud like kids, wave their arms saying, “Come see quick, there’s some calaniyot over there!” How tough and how soft they are at the same time. How contradictory and how integrated at the same time. Many Israelis go out to see the calaniyot on Shabbat afternoon. They bring their in-laws and cousins, set out sandwiches and lemonade, listen to music, and relax among the flowers. Its a kind of secular Shabbat that makes the field seem like a special and unique synagogue. The rest take their kids out of school on a weekday (“Hey, we’re going to see the calaniyot!”) or go off on Friday mornings when the kids don’t have classes. 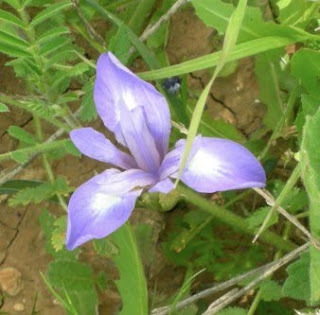 I haven’t met an Israeli yet who doesn’t at one point in February go out to see the calaniyot, and who isn’t thrilled, excited, bouyed to find out that the calaniyot are out. During the British Mandate, the soldiers were nicknamed calaniyot by Hebrew speakers because of their red berets. 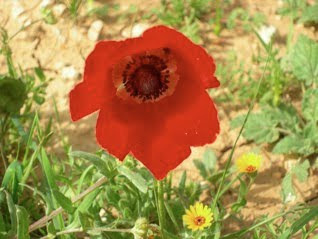 I thought of them, of all things, and of Flanders Field, as I looked out over the poppy anemones. So much death and sadness these Israeli fields have seen. So many soldiers and so much war. Many times it is possible to feel the dying hope and lost love in the air of Jerusalem. And yet...so much joy in the sight of a single flower. So much satisfaction in a short visit to the country. So much normal, so much sweet, so much touching in a few hours with the calaniyot. I admit that I was the Chanukah “one-present-every-night-and-a-really-big-one-on-the-last-night kinda mom when my kids were growing up. That was the family tradition in which I was raised, along with numerous tinselly type window decorations and a huge “Happy Hanukkah” banner across the front door. It made me proud to be so visibly Jewish at the most otherwise-invisible time of year. I felt “one of the crowd” with my peers and friends, even the Jewish ones. It was joyous, festive, and somewhat Christmasy, to be honest. My mom tried really hard to compete with the secular culture around us, and most years she won. I have very fond memories of those years, and Chanukah with my own kids was always something of a treat even if we didn’t go “all the way.” And while I am generally a Christmas Scrooge (I go grocery shopping with headphones on, listening to Israeli music so I don’t get jingle-belled into oblivion) I never really minded if the “holiday spirit” started creeping into Chanukah. So imagine my surprise when Chanukah came and went in Jerusalem without any hoopla at all. It was so understated that one could practically have missed it. “That was Chanukah? ?” my kids asked at the end of the eighth day. I mean, Yom Kippur was so quiet you could hear a pin drop even in the secular neighborhoods; Sukkot was a major deal with kiosks full of decorations, instant pop-up Sukkah marts on every corner, and public Sukkot at every restaurant. Even Rosh Chodesh gets its own “Have a good month” banners in restaurants and special services in shul. I did notice the electric menorahs on every lamppost on King David Street, the buses which flashed “Chanukah Sameach” on their front panels, and the glass-covered Chanukiot outside people’s homes. (First prize goes to the house that made its outdoor Chanukiah out of 8 recycled beer bottles and a Scotch bottle shamash hanging on a tree.) We went to lots of latke dinners. We heard Handel’s Judas Maccabeus in the Jerusalem Theatre. (That same concert also featured Handel’s Messiah. Go figure.) But there were very few Chanukiot in store windows—except those for sale— very little Chanukah music on the Israeli radio, and nobody buys anybody presents except for really little tzatchkes for really little kids. When I went to a local store and ordered something for my 20 year old son, she asked me when I needed to pick it up. I said “In time for Chanukah of course” and she looked at me as if she didn’t get it at all and I was nuts. It was, to be honest, weird to have Chanukah be “just” Chanukah, exactly the way we Rabbis talk about it every year in the Chanukah-isn’t-Christmas fight. In Jerusalem its really “just” Chanukah like we keep insisting it should be. Liberating, but a little lame. I have to confess: I missed the hoopla. Does it have to be all or nothing? It’s like Israel has gone the other way: since we don’t have Christmas (except in the Old City) let’s not have Chanukah either? Because “they” (the Anglo North Americans, the Russians, the foreign Thai workers) have a Christmas-Chanukah confusion, and they still celebrate their “New Year's Eves” which we know aren’t the real thing, (and which are shunned by the kosher hotels for fear of losing their kashrut licenses) let's not confuse them by making Chanukah a big deal? Even Tu B’shvat gets more press here. So the kids get their “winter break” at Chanukah and everyone goes to Eilat where you can light the Chanukiah in the hotel lobby. Maybe what we needed was some snow to get in the mood. I don’t know, but now that the darkness of December has passed, I’m waiting for Tu B’shvat for some fun. 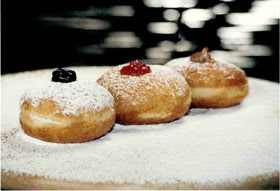 But there were lots of sufganiot in all the bakery windows for a full month before Chanukah! I was leading a group of 15 women from around the world on a Women’s Spirituality mission when the news broke: an Israeli woman had been arrested at the Kotel for wearing a tallit. The group was astonished, having just spent a lovely afternoon a few days before touring the Old City and putting their personal notes into the Wall’s crevices. Like most of my tours, this was a sophisticated group; they weren’t “just tourists” who think the haredim are exotic, interesting “specimens” of Jews. They got the politics. They got the tension. They got the history. They understood why I don’t take my groups walking through Meah Shearim, under the watchful eyes of the huge sign demanding exacting standards of modest dress from all women who enter, past virulently anti-Zionist signs (like “All Jews hate Zionists”), through narrow alleyways reminiscent of 18th century Poland where we “seculars” can take pictures of “quaint” religious children. They got that “Jews ‘R Us” as much as “Jews ‘R Them.” I hope that after an intense week in Israel, they got that they are responsible for the Jewish future as much as the haredim are. We debated: after all, the Kotel has been designated as an Orthodox synagogue rather than as a historical site (this after a 20 year battle from Women of the Wall to be able to read from a Torah on the women’s side) and those who enter an Orthodox site should abide by the rules of that community. On the other hand, since when is the Kotel a synagogue? It was disingenious from the start to designate it as such only after the Women of the Wall lodged their case, and to then give it to an Orthodox monopoly which now includes a men-only walking area in the formerly mixed back plaza. On the third hand, why should the women who want to pray together quietly as a group be forced to move to a non-public space? 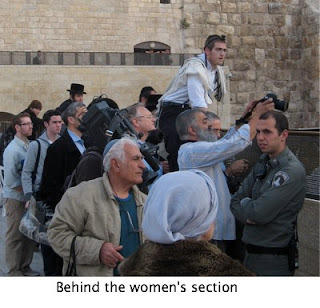 On the fourth hand why should a small group of women be allowed to disturb the status quo and the peace of the Kotel every month? On the fifth hand why is a woman wearing a tallit so disturbing, considering she is not obligated to wear one but neither is there a halachic commandment AGAINST her wearing one. On the sixth hand we are supposed to love all Jews and to remember the Second Temple was destroyed by the hate of one Jew to another. On the seventh hand how do we disagree with those (on either “side”) we think are so utterly wrong that it may one day destroy the Judaism we believe in...on the eighth hand, we simply need to be octopi to have enough hands for this discussion. 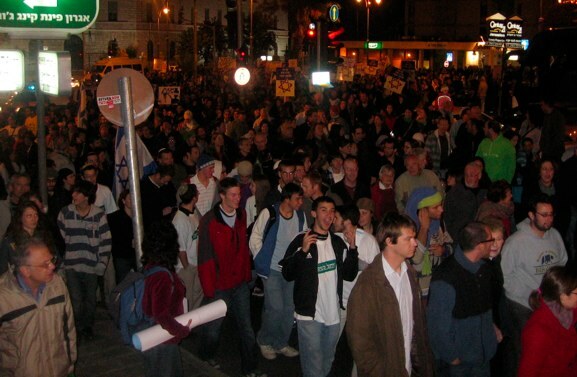 After the peaceful protest ended, 2500 people went up the pedestrian mall of Ben Yehuda Street, looking for felafel and making their way home. We were met by three dancing Hasidic men with huge yellow flags that said “Mashiach” on them; they had been trying valiantly to drown out the protest by singing to a recording of “Mashiach, Mashiach” as loud as possible into hand-held microphones. We tried to talk with them; they sang louder. We formed a circle and started dancing to the music; they turned off the music and moved away. I kept thinking of all the Jews who have pretty much abandoned Judaism while sending money to haredim so “they will be Jewish for us.” I kept thinking of the approaching festival of Hanukkah and its insistence on “dispelling the darkness.” In Jerusalem, a thriving new generation is trying to rekindle the light, by redefining who the they will be in the years ahead. I wish them success— for Jerusalem’s sake. A monthly blog on the oys and joys of being a liberal, female Rabbi on Sabbatical in Israel. Come and join Rabbi Goldstein on her upcoming trips to Israel. Details here.